Click on book cover check it out! 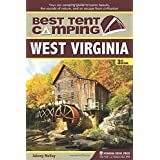 This book offers comprehensive coverage of the 50 best tent camping destinations in that beautiful place known as the Mountain State. If you want to explore and enjoy West Virginia, buy this book! The campground at Glade Creek is ideally situated for you to enjoy much of the gorge-ous scenery at this national river. From Beckley, take State Road 41 north for 9 miles toward Prince. Turn right on Glade Creek Road just before crossing the bridge over the New River. Follow Glade Creek Road for 6 miles to dead end at Glade Creek Campground. The New River Gorge National River is the recreational centerpiece for this part of West Virginia. It is 53 miles of free flowing water that runs mildly in some places and radically in others, creating paddling opportunities for canoeists, kayakers and rafters alike. The steep gorge and smaller gorges on side creeks make for natural beauty that can also be enjoyed on foot. And where there is water, there are fish. In the area near the Glade Creek Campground, which is one of the gorge’s finer tent campgrounds, fishing is good. And even if you don’t catch any, the river and forest at Glade Creek will raise your spirits. And if that doesn’t do it, then remember how much it costs to camp here. Nothing. Drive down to the end of dusty Glade Creek Road and turn into the campground. You are underneath a towering woodland of locust, river birch, buckeye, sycamore and tulip trees. Other smaller versions of the same trees and more cover the forest floor, creating a dense forest so thick a greenhorn could get turned around inside of 50 yards away from his last known spot. Glade Creek tumbles down from the Appalachian Plateau behind you and the New River rumbles off in the distance. Take the small road and come to the first campsite that provides a good sample of the drive-up campsites. It has a pull-through parking area and is culled from the lush growth around it. A picnic table, fire ring and lantern post adorn the lightly graveled flat spot. The modern vault toilets are in an elaborate building off to your right. The next campsite has a wooden platform and is handicap accessible. The remaining three drive-up sites are much like the first. Every one would satisfy even the most discriminating tent camper. The walk-in tent sites are over by the river at the boat launch. Park your car and walk down the sand bar, shaded in river birch and sycamore, and pick one of the five marked campsites. There are great views of the river through the trees. Across the water are the CSX Railroad tracks, which run the length of the entire gorge. Youíll find only rock fire rings at the walk-in tent sites, as this area occasionally gets flooded by the river and any tables and such would be washed away. The drawback of this campground is its size. It will fill on nice weekends by Friday night. Come here early Friday if you are a weekend warrior. Luckily, there is two a good campground just a few miles away. Just back on Glade Creek Road is the brand new Grandview Bar Campground. It has 20 drive-up campsites and 15 walk-in tent campsites. Glade Creek offers good camping, good boating and good fishing. A set of trails emanates from the campground. Just up from the campground was the old community of Hamlet. A trail leads upriver .3 mile to the site of the railroad bridge, whose construction caused the town to be here in the first place. The Glade Creek Trail follows an old railroad grade 5 miles up. There is good trout fishing along this stream. The stocked waterway is catch and release for the first three miles, and catch and keep after that. Glade Creek intersects the Kates Falls Trail to view a cascade. The Kates Plateau and Polls Plateau trails follow old railroad grades. White blazes on trees mark the paths, but be careful, as these trails are hard to follow. Anglers like to bankfish or get on the New in johnboats for smallmouth bass, which are numerous. The swimming is good in the river, but life jackets are recommended by the park service. There is a solid current. Another way to get on the New River is by canoe. The section of river from Hinton to Thurmond is class I-II with a few class III rapids. You can and should portage around two rough but pretty spots, Brooks Falls and Sandstone Falls. The five mile run from Glade Creek to Grandview Sandbar is a popular and convenient paddle from this campground. Speaking of Grandview, above you is the Grandview Visitor Center, accessible via Beckley. At Grandview there is a good overlook, interpretive displays and more park information. Also near here is the Cliffside Amphitheater where they put on the dramas, including “The Hatfields and McCoys”, which was played out in real life not too far from here to the southwest. Nearby supplies can be had in Beckley. Go ahead and splurge, since the camping at Glade Creek is free.